We prepare and serve food of the highest quality, with ingredients of certified origin, sourced exclusively from trusted suppliers. Our kitchen’s first and foremost prioritiy is to use seasonal ingredients and prepare them authentically. This means that ready-made products and additives are absolutely forbidden – everything, from home-made stock to macarons, is made from scratch. Extremely high standards for us; outstanding flavour and wholesome food for you. 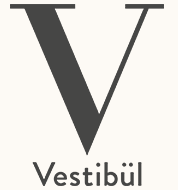 Home-made flavour from the Vestibül for your own kitchen? We are happy to supply stock, sauces & more to take home.